I love bringing my kids in the kitchen and teaching them to eat well. I also focus on and share quite a bit about hunger on my blog, including ways to take action and get involved around the issue of hunger as a family/with kids. I see sustainable eating (with an emphasis on local foods and foods made from real ingredients, not chemicals) as an important aspect of both teaching my own family (and myself) to eat well and ending hunger. (I shared a bit about this connection over at Multicultural Kid Blogs during Hunger Action Month). I'm grateful to Conveying Awareness with Jessica David for introducing me to Food Day, which is today and is a nationwide celebration focused on healthy, affordable and sustainable food. I discovered Jessica through Facebook and appreciate her healthy living tips and the recipes she shares on her blog. 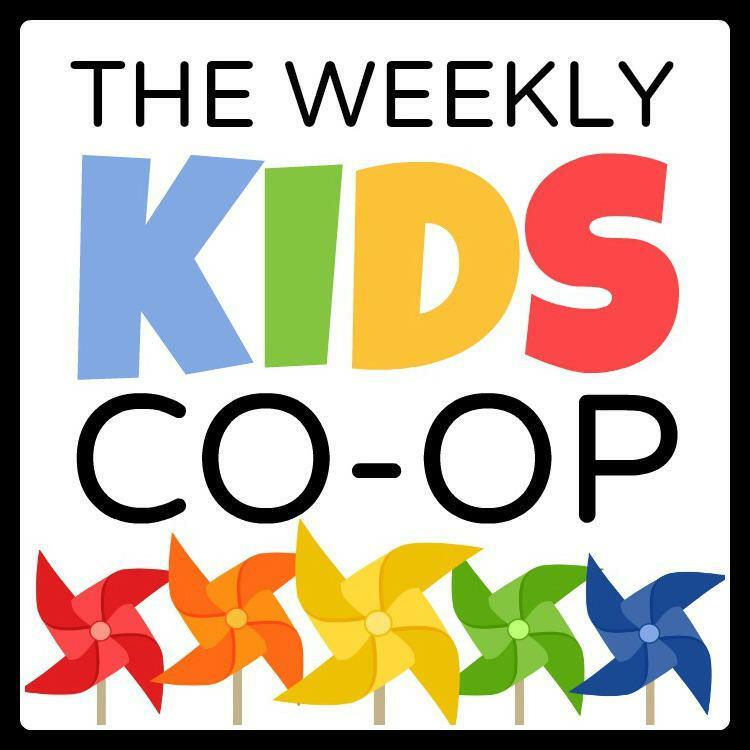 In honor of Food Day, I selected some fabulous kids in the kitchen activities and real food recipes shared last week as part of The Kid's Co-Op. I hope these inspire you to get in the kitchen with your kids, some fresh produce and whole ingredients and get cooking! Apples are our go-to fruit. My boys LOVE them, and it's a snack I can feel good about giving them. 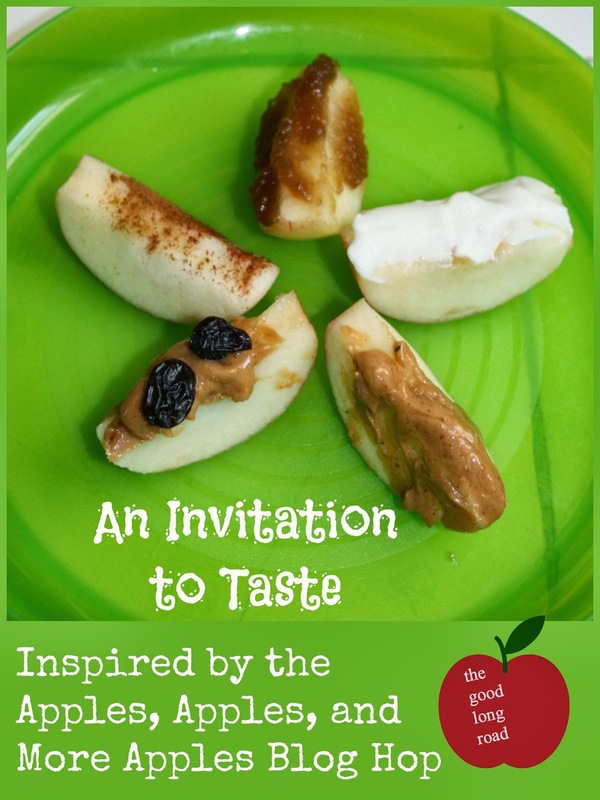 Last week, I linked up our Apple Taste Activity and some other apple-inspired fun (including a free printable color sheet), Sow Sprout Play shared 15+ Apple Activities and Recipes, and House of Burke shared her Apple Taste Test Sensory Activity, which I loved -- she compared different types of apples and forms (apple slices, freeze dried apples, apple mum mums and applesauce). Our taste included (clockwise): apple butter, plain yogurt, peanut butter, peanut butter with raisins, and cinnamon. I love Lessons Learnt Journal's 2 Ingredient Sweet Bread -- we make a version of this often using plain greek yogurt and self-rising flour. Inspired by her sweet bread version, I'd love to try adding in some pureed pears and a hint of brown sugar. Highhill Education gets bonus stars and creativity points for her very cool Human Body Blood Activity that includes 2 fruits, 2 veggies and yogurt -- all used in an edible way to teach about the human body. How cool is that?! 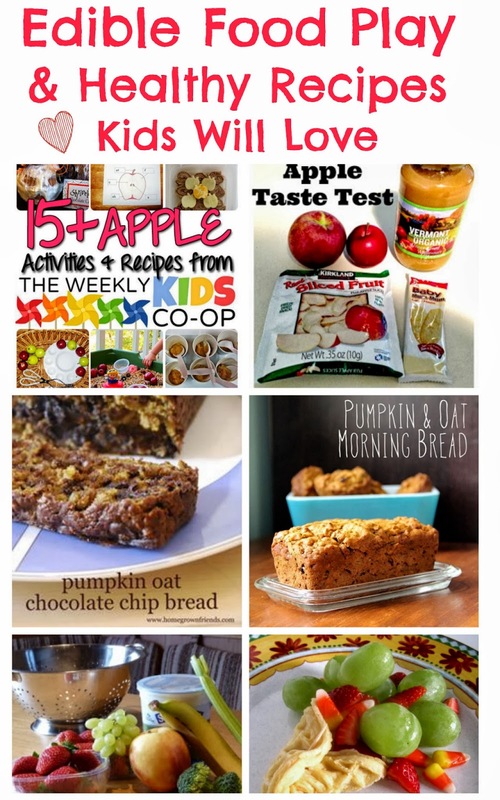 B-Inspired Mama shared a creative way to enjoy fruit with her Thanksgiving Cornucopia Snack. I'm eager to try both of these recipes, which feature oats and pumpkin -- two real food/whole food ingredients I absolutely love: Pumpkin and Oat Morning Bread from Crafting Connections and Pumpkin Oat Chocolate Chip Bread from Homegrown Friends, which includes maple syrup (real, not imitation) as the sweetener, which is a healthy baking option I use a lot as well. 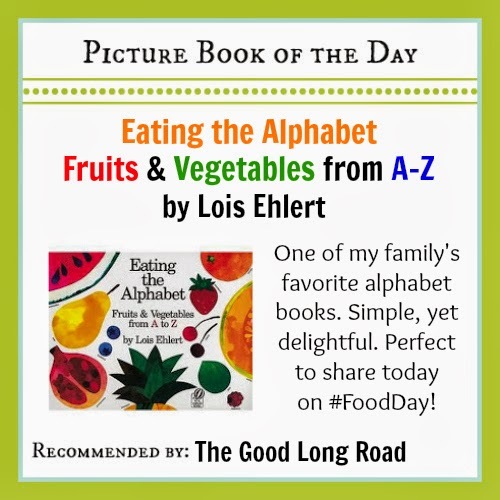 For Food Day, I'm also sharing one of our favorite alphabet books, which is also a book I use often to encourage my boys to try new fruits and vegetables -- and my pick for Picture Book of the Day (here's a bit more about the blogger crew involved with Picture Book of the Day). Last Fall, I shared 30+ Kid-Friendly Recipes for Meatless Monday inspired by this book. #kidsinthekitchen for some fun and creativity! Now, Link Up and Play! !